And after four months of wait I got 5000 units of this material. And then try out the unit operation. 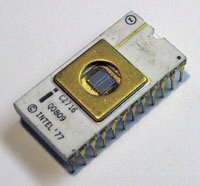 If it works fine, else this IC was put in a UV ERASER for 20 minutes and the whole operation started. After every things looks okay (which usually happens after testing for 20 to 30 days) then program was burned in similar ic without window and unit was handed over to customer for testing. He usually comes back with few bugs or some changes and process starts again. Well, after he approves the design, the data of hex file was printed and sent to Motorola (or which ever company provided the micro controller). Motorola will resend few papers and ask for signatures. And then we compare the Motorola printed sheet with what we printed to look for any typing mistakes and sign it. This design will goto Motorola foundry and after a period ranging from 12 to 16 weeks, Motorola deliver 5000 or more ic printed with our special code. These specially fabricated ICs were then used in manufacturing. Any mistake in the document and end product will not work as expected as Motorola's guaranteed delivery of parts with information that we signed on their papers. And this was reason for me sweating on that cold evening of December. The reward too were high. Against a normal price of USD 6 for normal ic, we get product at USD 2.6 including the cost of one time charges. And all subsequent parts at USD 2.